Today I sat down with my 13yo son and played it. He had already consumed the instruction manual, and he taught me to play it in a single round, which lasted about ten minutes. Over the next half hour we played two more rounds, and at the end of the game session he’d beaten me two to one. It would have been two to zero, but I insisted upon a final game, which I think he may have thrown, because he got both his Ogres out early (read: “as close to simultaneously as the rules allow”) but didn’t press his advantage with cruise missiles. If you want a tutorial, Steve Jackson and friends have provided one! I didn’t think Steve Jackson Games could deliver something satisfying that played faster than Zombie Dice¹, but with the help of It’s Your Move Games² they totally did. Ogre: Objective 218 is fun for casual players, and is also good for folks who count cards and adapt their tactics in accordance with shifting statistical models. It lists at $14.95, and is probably available at any store that carries Munchkin. It’s also available at Amazon, for folks like me who will probably stop leaving their homes once drone delivery of everything is a reality³. 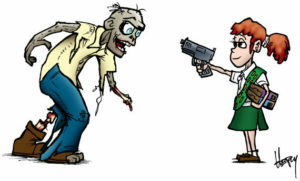 ¹ My Zombie Dice review is up at Steve Jackson’s site. It glows like the eyes of an irradiated feral ghoul. 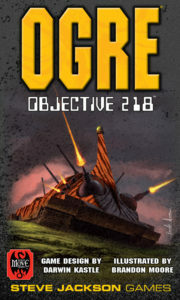 ²Ogre: Objective 218‘s game mechanics are based on the game Battle for Hill 218, copyright © 2007 by It’s Your Move Games, Inc. Used under license. ³It’s already begun. I move around so little that my FitBit stopped telling me about goals, and simply withered and died, like an unwatered philodendron. Sandra and I will join Jim Zub and the Hypernode Corps of Conventioneers at GenCon Indy this week. You can find all of us at Booth #1343, an endcap installation featuring two hundred square feet of pure¹ magic. Magic², you say? Absolutely! I have so much work on my plate that I’ll be spending much of my booth time penciling and inking comics. I’ll happily set that aside to do sketches in your books, so if you’re attending GenCon this year, please stop by! If you’re trying to decide which of my panels to attend, I suggest “Comedy Gold.” That’s my solo presentation for writers who want to learn to be funnier. It’s all about refining the joke, and the presentation itself will probably be pretty entertaining whether or not you write. The Writing Excuses³ session is also going to be quite cool. Dan Wells and I (the only two WX cast members at GenCon this year) will have several different guests on during the two-hour block, and our interviews with them will range across several topics. What will it be about? We don’t actually know yet. ²Not “Magic: The Gathering.” I don’t play. Sorry. *I do take breaks from time to time. Stop by during that block, and if I’ve gone for a walk, the folks there will let you know when I’ll be back. ³If you’re not yet familiar with Writing Excuses, it’s a podcast for Writers which we’ve been doing for just over eight years now. We plan to ship in September 2016, rather than in May as originally planned. May is now impossible, and even July would mean rushing the editing and final layout phases. We don’t want to “rush” anything. We want this book to amaze and delight you. And now we plan for that delighted amazement to land in Autumn rather than Spring. This schedule should let us have PDFs out to all backers in July. If you will be at GenCon in August, we will have a few advance copies for people to handle, but not to take home. 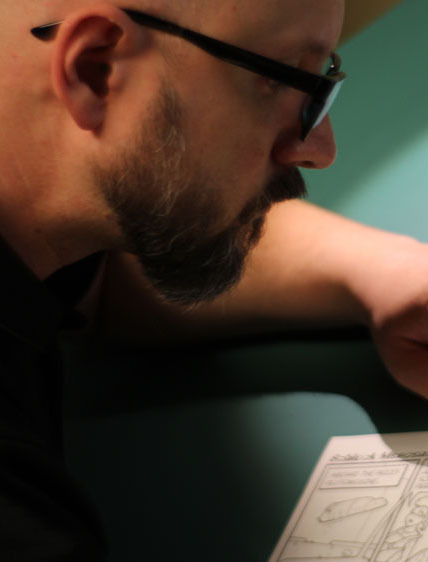 Back in December we began working with Patrick Kapera, who is serving as our editor, and as an RPG expert who does not know the Schlock Mercenary universe. When Patrick joined us he was pleased to see that we were much closer to a finished product than he expected us to be. We were not, however, as close to a finished product as we thought we were. At that point we expected that we would be sending things to our printer in April rather than February. Shipping to the printer in April would have meant that we could ship books to backers in July, and then have books to sell at GenCon Indy in August. During the last week of February, however, we carefully evaluated the progress we’d made, and realized that April wasn’t realistic. Sandra and I decided immediately that we would not try to have the books at GenCon¹. That would have been terribly unfair to you, our backers, who wouldn’t receive your Planet Mercenary goodies until after people who bought them at the convention. So where are we, really, in terms of the book? Editing is 100% done on the Mayhem Cards and Mayhem rules. This means the cards can go to print now. Editing is 75% done on the rules text. These sections on character creation, basic rules, ship combat, charter rules, and equipment are by far the most time-consuming part of the editing, because there are words that must be used very precisely to avoid confusion. Layout is running in parallel. As pages clear Patrick’s queue, they get final layout. Overall, the layout is only about 10% done, but every day more pages get finished. Art is about half done. We took a long break when we realized that we needed much more layout finished before we could know what art to go get. During March, April, and May we’ll be grinding hard on the art. The “fluff” text is about 75% done. Once Patrick reaches that stage, he and Howard will be blasting through it very quickly. Patrick’s job is to make sure that Howard tells players what they need to know while finishing the various worlds, cities, warrens, and Big-Dumb-Objects that will go into this book. In word-count terms, Howard probably has another 15,000 words to write. That’s about a week of work, once Howard knows which 15,000 words Patrick wants players to have. It’s worth noting that one of the most popular elements of this project, the in-universe copy ofThe Seventy Maxims of Maximally Effective Mercenaries, is coming along nicely. Howard has about 3,000 words to write here, but we already have book-blanks in hand that are telling us we’ve picked the right paper, and the right aspect ratio for the pages. There is a remote possibility that the 70MoMEM books will go to the printer early—far enough ahead of the core RPG book that we will be able to ship Maxim books separately. We’ll post an update if the print schedule and the shipping budget can be aligned to make that happen. We’re sorry to slip the schedule, but we believe that the extra three months are necessary for us to deliver an RPG that meets the high standards you’ve come to expect from us. Thank you for your patience, and again, thank you for your generous, enthusiastic support for this project. 1: Yes, this decision costs us about $10,000 in lost sales at GenCon Indy. We budgeted this project independently of selling things at GenCon, so we’re not actually losing any money by doing this. We’ll find other things to sell in Indianapolis this August. 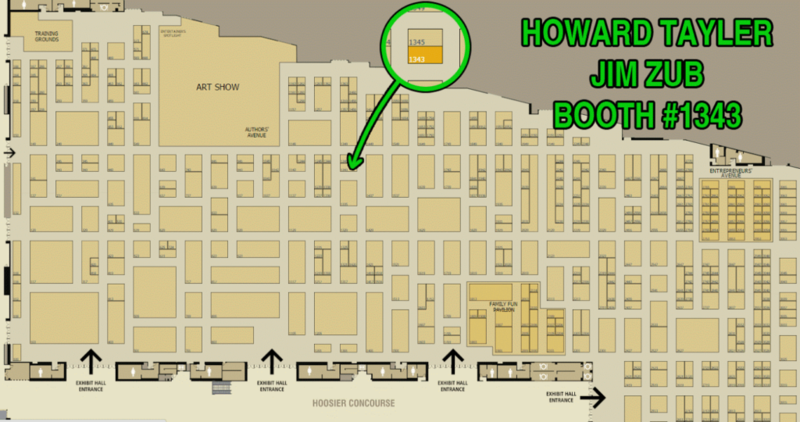 I’m exhibiting at GenCon Indy with Jim Zub and Tracy Hickman this week. You can find us at booth 1935. We have new pins and badge holders, and all eleven print editions of Schlock Mercenary, along with slip cases. When I’m not in events I’m almost certainly at my booth, though I have been known to sneak out for breaks from time to time. Mostly, though, I’ll be glued to my seat working on the cover art for Schlock Mercenary: Force Multiplication. 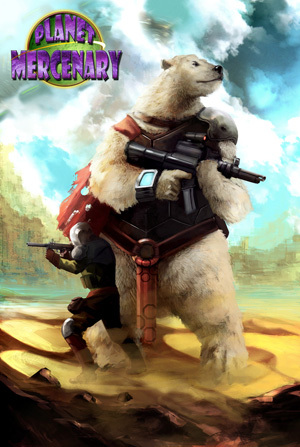 I’ll also have some images from the upcoming Planet Mercenary RPG book if you’d like to peek at those. GenCon Indy is one of my favorite events of the year. We have a fantastic crew working our booth with us, and Tracy, Jim, and I have lots of fun talking with fans and with each other throughout the day. Come get stuff signed, or just stop by and watch the magic happen.